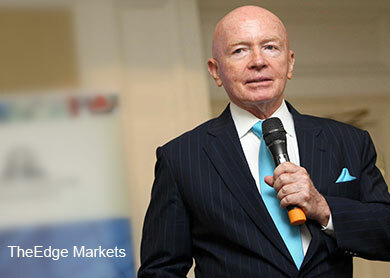 KUALA LUMPUR (Oct 20): Investors should be making decisions based on dividend yields over the short term, given the high valuation of the FBM KLCI, according to Templeton Emerging Markets group’s executive chairman Mark Mobius. Speaking to reporters after a luncheon talk today, he said investors should pay attention to stocks within the consumer and banking industries, as those stocks traditionally rewarded shareholders well. "Banks, in particular, I'm very interested in because they would reflect the growth of the country, more diversified and less volatile as a result, and you get a nice dividend yield," he said. "At this stage, [a dividend yield strategy] would be the best way to go, since it’s [the Malaysian stock market] a relatively expensive market in price-to-earnings ratio terms," he added. Mobius also said he thought the FBM KLCI would end the year higher, barring any unforeseen circumstances.